Eastlight Theatre was created by an Intergovernmental Agreement between three local entities: the City of East Peoria, the Fon du Lac Park District, and the East Peoria Community High School. These three governmental bodies recognized the need to cooperate to assist each other in the achievement of a number of benefits for the community. The City views Eastlight as a means of furthering its goals and quality of life for the individuals of the area by the offering of excellent family entertainment. The Park District views Eastlight as a means of furthering its goals and objectives of providing additional and new means of artistic programming to individuals of the area by the offering of entertainment and the establishment of workshops, seminars, and drama camps. The School District views Eastlight as a means of furthering its goals and objectives of providing further recognition and enhancement to its drama department as well as providing further drama opportunities for its students. These shared goals and objectives inspired these governmental bodies to pool their resources and strengths for the creation of one of the most unique community theatres in the nation. 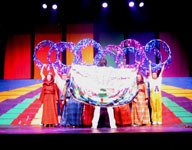 The purpose of Eastlight Theatre is to provide and promote the dramatic arts by delivering performances of the highest theatrical quality; to provide a forum for the performance of new plays and musicals; to contract with “outside" professionals to improve the quality of selected performances; and to initiate an educational program to help develop the artistic and dramatic talents of the tri-county area youth and adults. With the continued support of the City of East Peoria, the Fon du Lac Park District, and East Peoria Community High School, Eastlight Theatre will be around for many years to come.